Whitstable Cricket Club is one of a growing number of Cricket Clubs that take the welfare of children at their club incredibly seriously. By taking the time to work towards and achieving ClubMark Whitstable Cricket Club has shown its commitment to its junior players and to its wider local community. 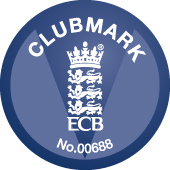 The ClubMark logo is recognised by both ECB and Sport England and it tells teachers, parents, community leaders, Local Authorities, funding agencies and all those with a responsibility for the welfare of young children that Whitstable Cricket Club is a safe place for children to enjoy playing cricket. More importantly it proves that Whitstable CC, Belmont Road is a club that you can send your child safe in the knowledge they will be well looked after and enjoy their cricket. * Ensure sport's national governing bodies (NGB's) have core common criteria to ensure good practice runs through all development and accreditation schemes. * To empower parent's/carer's in choosing a club for their children. * To recognise an accredited club through a common approach to branding. * To provide a focus around with NGBs, Sport England, Sports Coach UK, Child Protection in Sport Unit, County Sports Partnerships, English Federation of Disability S'port, Women Sports Foundation, Sporting Equals, Local Authorities and others can come together to support good practice in sports clubs working with children and young people. * Ensuring the well-being of young people whilst in the care of adults, other than legal parent's/carer's. * Enthusing young people to enjoy sport and active recreation to build a healthy lifestyle. * Enabling young people to use their leisure time creatively. * Developing young people's talents. * Identifying and developing the most talented young people for representative sport. * We will be better organised and resourced as a club and able to further develop. * We will be in a position where we can increase membership if necessary to ensure the future of the club whilst increasing the competitive pool from which to draw in the future. * We will be networked into local and national sports organisations that can provide further support. * We will be promoted in the local community and on a national database. WHAT HAVE WE DONE TO ACHIEVE CLUBMARK? * All volunteers working with children and young people have been police checked (CRB Enhanced). * Any senior member who is around children and young people on a regular basis have completed "Self Declaration" forms. Now we have this accreditation the work doesn't stop! We will be constantly monitoring the situation to ensure that we provide the right facilities for the club to develop. If you have any questions relating to Whitstable Cricket Club's Clubmark accreditation, please contact Lorne Hart on 07999 657295. For general information click on the Clubmark Logo for a link to the Sport England Clubmark Site.